The neoliberal project has led to the growth of corporate food in the Global South. Industrial animal agriculture has spread, spawning a global livestock complex. Industrial horticulture has developed in many Southern regions, giving Northern consumers the opportunity to consume fruits and vegetables year-round. Corporate service (e.g. McDonalds franchises) and corporate retail (e.g. supermarkets and hypermarkets) have unevenly been capturing a larger percentage of the consumer market throughout the global South. At the same time, chronic rural poverty and food insecurity have persisted. In my research, Food and Revolt: Egypt, ecology, frontiers, I analyse the commodification of food, and the growing power of corporations in agriculture and food in Egypt. I argue that Egypt’s participation in the expanded world market during the two periods of so-called globalization depended on the development of new lands for commercial agriculture. During the long 19th century (c. 1820s-WWI) and the neoliberal period (c. late 1970s-2011), the continual expansion of cultivatable lands enabled and limited the acceleration of cash crop production for distant markets. In the neoliberal period, this desert frontier has enabled the growth of a corporate agri-food system, and this growth has contributed to class-based vulnerabilities to global food prices, losses in smallholder livelihoods, and public health threats (e.g. Avian flu). This has, in turn, engendered popular revolt against the ruling political regime, culminating in the 2011 uprising. Land reclamation refers to the development of lands for expanded commodity production that were either not cultivated until recently or not intensively cultivated and through the development of an irrigation infrastructure, transportation routes, labour force, and the other enablers of larger scales of production and of connections to markets. During the colonial period and the neoliberal period, waves of land reclamation in Egypt responded to global commodity booms. Throughout the 19th century, global price increases in cash crops for export to industrializing Europe spread sites of production from settler states to colonial states and soon-to-be colonized territories, like the Ottoman province of Egypt. In the neoliberal period, growing food retail and food service for affluent consumers domestically and abroad spread industrial agriculture from temperate regions to Southern regions. In Egypt investors responded to the growing markets by expanding production of fruits and vegetables and animal protein and by expanding food processing. During both periods of expanded commodity production, the state would grant rights to investors to cultivate the land and investors with the help of the state would draw irrigation water, labourers, and other resources from existing agricultural areas to the new lands. The new lands would become the locus of large-scale investments in agriculture (and food processing). This expansion of commercial agriculture would eventually lead to the degradation of the ecological conditions of production (e.g. social erosion, multiplication of pests). The resulting rising costs of production then precipitated the development of new lands, farther from existing agricultural and residential areas. This double movement of commercial agriculture – from temperate to Southern regions on a world scale and from existing agricultural lands to reclaimed lands within Egypt – reflects the ecological foundations of agricultural industrialization and in the neoliberal period the accelerating crises of industrial agriculture. In the neoliberal period farm organization and on-farm practice have transformed toward an increasingly coercive and capital-intensive set of agritechnologies and practices to manage the volatility of industrial agriculture (from monocultures, perpetual genetic erosion, cropping intensification, and so on). And it is more capitalized firms that have been able to afford adopting these measures that govern industrial agricultural production and global agri-food trade. In Egypt, during farm visits on reclaimed lands and in interviews with agribusiness executives and managers, attention and resources on farms and in business operations were devoted overwhelmingly to threatening situations due to the blurring of the inside and outside of the production zone. Recurrent threats to poultry from parasite populations provided an initial push and pull from the Delta into semi-arid areas, and this movement became especially pronounced following the 2005-06 Avian flu outbreak. Many of the first investors to move into the new lands in the 1970s, at the time of President Anwar Sadat’s infitah (opening) policy, were building industry poultry complexes. The containment of parasite populations was cited as a motivation: containment was (and is) understood to be better assured with distance between farms and from residential areas. In response to the Avian flu outbreak, corporate poultry, which dominates the breeding of broiler chicks, further consolidated their market share and built more ‘fortresses’, as one poultry executive called them, and farther into the desert. While much revolutionary activism and commentary in recent years focused on the illicit ways the ruling class – the political elite and the business elite – accumulate wealth and privilege, through my own participant observation in a family business in the business district of Cairo (Mohandiseen) in 2009, I have seen that the reformulated ruling class created class cohesion within the Egyptian social structure through legal transnational networks of family, education, and investments. However, a tension lies in the constitution of their class power: the very means to cement their class position engendered a popular (and subversive) critique of their entitlement to accumulate wealth, to govern, and so on. Their attempt to cement their class position through the growth and consolidation of the agriculture and food sector further exacerbated this tension, given food’s material and symbolic functions that link nature, human survival, livelihoods, culture, and health. Popular critiques of growing inequality took many forms, including among smallholders and advocates who had been organizing against structural adjustments. Since the early 1990s, structural adjustment policies had accelerated the buying and selling of land in existing agricultural areas in the Delta and Nile Valley and in reclaimed lands and had led to millions of farmer tenants and smallholder land beneficiaries losing their rights to land. These policy changes simultaneously eroded the social contract, which had made smallholder agriculture viable in the post-independence period, and bolstered the growth of corporate food. The continual reclamation of land depended on drawing Nile irrigation water from the Delta, the state agriculture and transportation budget, and labourers from nearby Delta provinces. Yet, the promise of greening the desert policies continued to gain an audience among this network. The promise of greening the desert to solve a host of societal problems emerged immediately after World War II. To diffuse the tension from the growing polarization between the wealth and power of the ruling class and the immiserated peasantry, land reclamation began to be used as a policy to distribute land to peasants. Beyond being a commodity frontier, land reclamation from the post-WWII period onward became a way to resolve the inherent tension of bourgeois society. Frontier making develops a unique character in the post-World War II, post-independence period. However, by the 1970s and 1980s the frontier again becomes a main site of commercial agriculture as it was in the long 19th century. From the perspective of the frontier, the neoliberal moment represents not a rupture with the past nor a seamless continuity in historical time (e.g. colonial legacies). Rather, the neoliberal period is a moment of a reconstituted world market – and society and polity in Egypt are shaped by the conditions through which the modern state participated in the world market of the colonial period. Growing class polarization that marked the long 19th century, especially the period of direct colonial rule beginning in the early 1880s, was marked by cross-class anti-colonial movements. Growing class polarization in the neoliberal period is reflected in part in the dual (formal/informal) character of the country’s corporate agri-food system. The commodity chain of key corporate foods reveals that smallholders have been both excluded from direct consumer markets with the growth of corporate food and included in corporate commodity chains (often on a non-contractual basis). More than this, in so far as smallholders have been able to hold on to plots of land with the systematic undermining of the agrarian reform institutions of the post-WWII, post-independence period, they have been changing what they grow – e.g. berseem or animal feed for dairy cows, dairy cows for raw milk. Much of these foods are corporate foods, or more precisely, basic ingredients that are re-combined and re-packaged to make durable food commodities. As such, a reconstituted peasantry has been ‘the domestic supply’ of a number of key corporate foods (raw milk, potatoes). In turn, domestic diets have shifted toward food high in animal protein, fats, and sugar. As in the global food economy, there lies a space of dietary convergence – where the affluent and working classes alike consume industrial, processed foods. 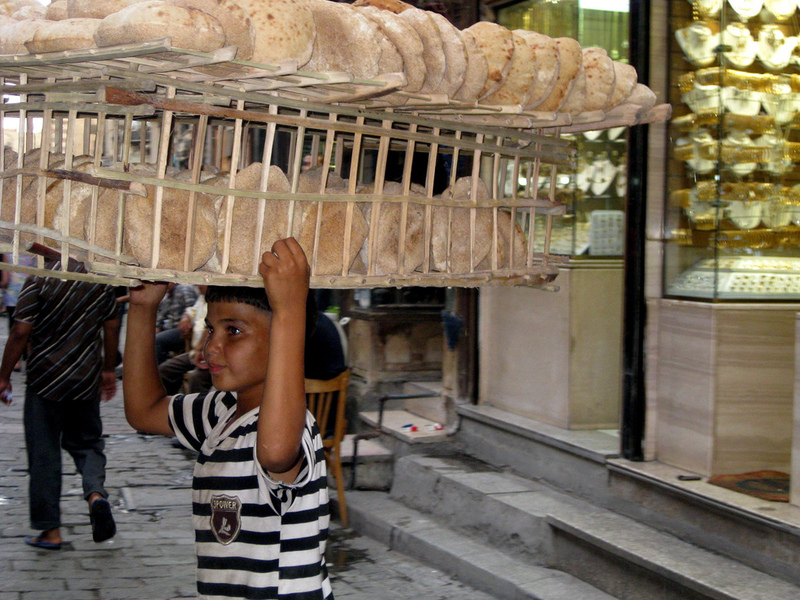 A reconstituted middle class was supposed to be born in the neoliberal project through an expanding private sector and rising private consumption and because the consumer market of corporate food is wide in Egypt, a disparate middle class was able to ‘buy in’ – whether it be the low-end supermarkets or the street kiosks of snack foods and soda drinks. However, this new national consumer, by definition, is one of uneven access to the corporate food market – a market skewed toward the global consumer class in Egypt and abroad, in effect revealing the hallowed structure of the middle class. The success of the corporate agri-food system as a class project is the fact that across class Egyptians had been able to buy in to the neoliberal project. The space of dietary convergence provided a societal consensus that legitimized the project, at least temporarily. However, its failure – one of many – was that the growth of corporate food did little to reduce food costs as a percentage of income for the vast majority of Egyptians. This failure began to become apparent at the time of the 2007-2008 food crisis, during which a labour protest in the industrial town of Mahalla erupted and spread to other parts of the country. When food prices began to rise again in 2010, a government official confided in an interview that an undisclosed government study confirmed a direct relationship between food prices and revolt. If prices of a few key food staples rise above a certain percentage of income, eighty-three percent of the time Egyptians will revolt. Months later they did. Marion W Dixon will be a faculty member at Point Park University in Pittsburgh, PA beginning this 2018-2019 academic year. Her research includes agriculture and food, with a focus on the Middle East and North Africa. For overviews of the spread of corporate food around the world, see: Burch, D. and G. Lawrence, eds. 2007. Supermarkets and Agri-Food Supply Chains: Transformations in the Production and Consumption of Foods. Cheltenham, UK: Edward Elgar; Wolf, S. A. and A. Bonanno, eds. 2014. The Neoliberal Regime in the Agri-food Sector: Crisis, Resilience, and Restructuring. London and New York: Routledge. The International Fund for Agricultural Development (IFAD) regularly keeps figures on rural poverty; see these 2011 figures worldwide, https://www.ifad.org/documents/10180/c1bbf5fa-bdc3-4ea6-9366-d163b95b1180. And the UN Food and Agriculture Organization (FAO) tabulates yearly statistics on food security and nutrition; check out the 2017 report on the status worldwide, http://www.fao.org/state-of-food-security-nutrition. Moore’s (2011) concept of relative exhaustion has been useful for capturing the relational character of frontier making in Egypt: Moore, J. W. 2011. “Transcending the metabolic rift: a theory of crises in the capitalist world-ecology.” Journal of Peasant Studies 38(1): 1-46. McMichael (2000) refers to these connections as ‘the power of food’; McMichael, P. 2000. “The power of food.” Agriculture and Human Values 17: 21-33. Bush, R. 2014. “Food security in Egypt.” In Food Security in the Middle East, edited by Z. Babar and S. Mirgani, pp. 89-114. Oxford: Oxford University Press. On outward/territorial expansion as a way to resolve the tensions of rising inequality, etc., see Hegel 1942 cited in Harvey 2001, p 286: Hegel, G.W.F. 1967. Philosophy of Right. Oxford: Clarendon Press; Harvey, D. 2001. Spaces of Capital: Towards a Critical Geography. New York: Routledge. Stoler, A.L. 2016. Duress: Imperial Durabilities in Our Times. Durham and London: Duke University Press, p 25.